Man, do I love soft pretzels. The chewiness. The saltiness. I could eat them everyday (I don’t and I shouldn’t). The soft pretzel is one of the best foods to enjoy at a baseball game, right up their with the hot dog. 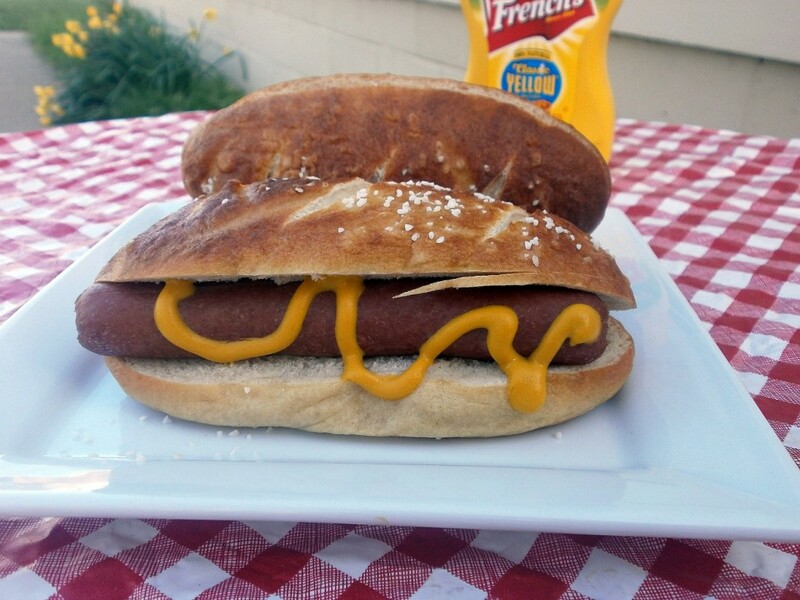 Why not combine the two in the form of a hot dog inside of a soft pretzel bun. Combining the two may be one of the best ideas ever hatched – wish I thought of it first. I am going to teach you how to make them. Trust me they are worth the effort. 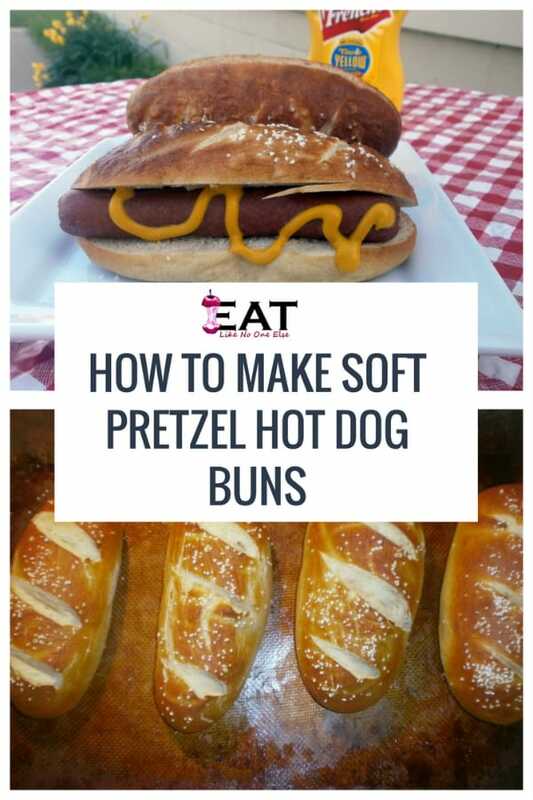 The very first recipe I wanted to try that I saw on his show was you guessed it – Soft Pretzel Hot Dog Buns. Every time I say that I get hungry. 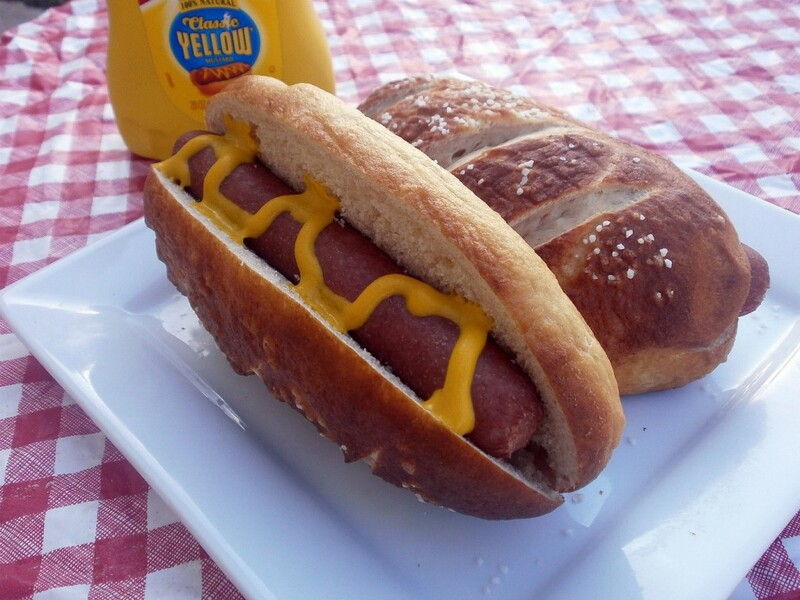 Soft Pretzel Hot Dog Buns. Yep, level of hunger just rose. Doesn’t that look amazing! It’s as yummy as it looks. I didn’t forget the mustard, a pretzel’s best friend. Here is the full ingredient list for the recipe for the Soft Pretzel hot dog buns (my person hunger level rises to level 5!) as taken from Food Network’s site. To read his full instructions, visit the Food Network site. I noticed there was no salt called for in the actual dough itself. Obviously pretzel salt is sprinkled on top, but I thought the dough could use a little salt for those bites where you don’t get some salt. I decided to add in about a 1/4 teaspoon of kosher salt. Also I have not tried making them with the chopped garlic. My wife requested that I leave it out. Not that she doesn’t like garlic but she doesn’t want in this these pretzel buns. 1. You start by warming up the milk with the sugar and honey. Not too hot, just to about 100-110 degrees or so it feels warm to the touch. We are doing this for two reasons – to dissolve the sugar and honey and to warm up the milk for the yeast. Yeast thrive in warm environments. Adding it to warm milk will help get those fungi going (yes, yeast is considered a type of fungus). 2. You then mix together the flour and the kosher salt that I recommended. After that it’s time to add the melted butter as well as the milk/yeast mixture. 3. Now it’s time to mix it all together to form the dough itself. This is called the kneading process. You can do this with your hands, but if you got a stand mixer that would be a lot easier. You can also do this in a bread machine. Just select the dough setting and pull it out when the dough is done. 4. How do you know the dough is done? It should be elastic. That is from the gluten. It should feel smooth as well. Here are the buns as they are rising. This is from the first time I ever made them, back in my old poorly lit kitchen. It was amazing I could ever take any good photos in there. 1. The method of this recipe is different than what I normally use when making yeast breads. 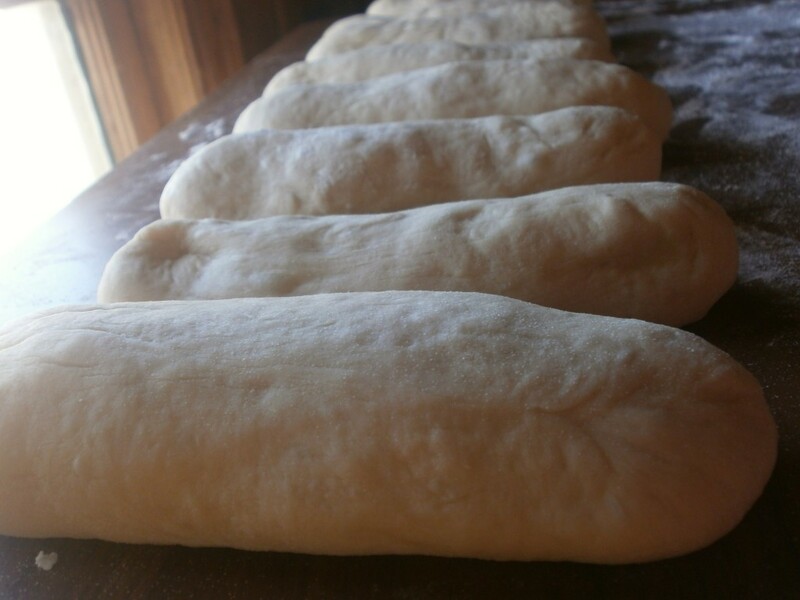 You don’t need to let the entire dough rise for an hour after kneading. Instead you are going to let it rise in smaller pieces and for shorter periods of time. 2. Cut the dough into 4 pieces and then cut those pieces in half. You will then have 8 – the same amount of hot dogs you find in most packages (Hebrew National not included with their 7 dog packages). Now these buns are going to be on the large side, which I like. But if you want them to be smaller, more of the traditional hot dog bun size you can try cutting then into 10 or 12 pieces instead – I think 8 is just fine. 3. Roll each piece into a ball and let it rest for about 15 minutes covered with a regular kitchen towel. Great time for a bathroom break or to feed the pesky cat. 4. Roll the balls into logs that are about 7 inches or so long. Place them onto a baking sheet. I highly recommend you cover the baking sheet with either parchment paper or a silicone mat. You will be sorry if you don’t (it will be sticky!) Cover them again and wait for 30 minutes. If you just place them directly into the oven from here, they will never get that deep brown color and great pretzel flavor that you want. What you need to do is boil them briefly in water that has had it’s pH increased. This is done easily through the use of baking soda. Some professional bakers use a food grade lye. However baking soda is so much easier to come by. 1. Bring 8 cups of water to a boil in a large pot. If you have a wide pot that would be best. Add the baking soda. 2. Cook each soon to be pretzel 30 seconds on each side. A slotted spatula works best for flipping and removal. Cook them in batches. No more than 2 or 3 at a time. 3. Add the pretzel salt when they come out of the water. This will help it to stick. You could also do an egg wash, that is 1 egg yolk with a little water added. I find this works better than just water alone and helps with browning. But you can skip the egg if you want. 4. Cut three diagonal strips into each bun. I like to do this with a pair of kitchen shears. Just don’t go too deep. Doing this will make the nice indentations you see in the photo at the top of this post. 5. I have some genuine pretzel salt that I use when making pretzels, which I do quite often. I used pretty coarse kosher salt in the past, but the shape of pretzel salt is so much better for pretzeling (Alton Brown says that it’s a word!). 1. You want the oven to be nice and hot for baking these pretzel buns. Preheat to 425 degrees. 2. Place the salted, boiled pretzel buns onto 2 separate sheet pans, so that they don’t touch when baking. 3. Bake for 10 to 13 minutes until golden brown. I advise rotating the pans between the top and bottom racks. This will insure that they all cook evenly. Do this about half way through the baking. 4. Allow to cook on a cooling rack until ready to use. Without a doubt these are the best hot dog buns I have ever had. Bar none. So soft and flavorful. They make any hot dog you put in them a rock star – still choose a good hot dog to make the experience even better. One last tip. Don’t cut the buns open to receive the hot dogs until right before serving. This way they won’t dry out. A second one last tip, if you are going to store these I recommend doing so in the freezer. Soft pretzels freeze really well. Just warm them before when serving.